4601 37d 2 Mk. Dull violet puple, fresh colors and very well perforated, minimal thin, otherwise in perfect condition unused with original gumming. A very impressive copy of this rare and nearly always missing colour! Expertized Zenker BPP. Michel 2000,- €. 4602 38a 50 pennies gray green, wonderful fresh colors and in perfect condition unused with original gumming. A very nice copy this nearly always missing issue! Photo expertize \"faultless condition\" Jäschke-Lantelme BPP. 4603 39Ia 3 Pfg. 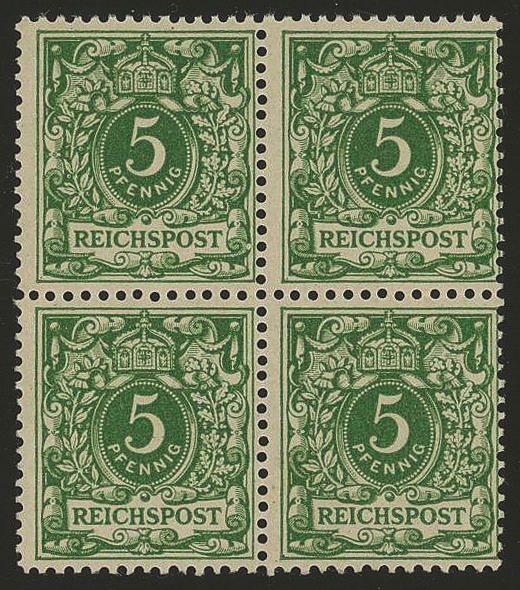 Green, early edition, horizontal strip of five from lower margin, right stamp creasely, otherwise are all stamps in perfect condition mint never hinged, only in the lower margin a little creasely and above is the perforation partial a little separated. An extremely scarce and attractive unit! Photo expertize Jäschke-Lantelme BPP. 4604 ✉ 40/41,44 5 Pfg. (4), 10 Pfg. Block of four and 50 Pfg. 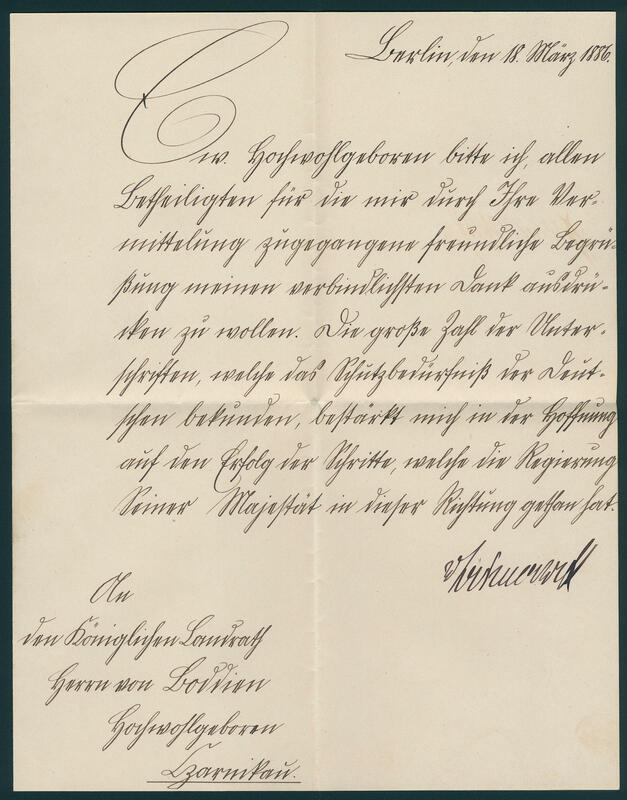 As all extraordinary franking-combination on insured letter over 4590,- Mk., a little patina, from \"MAINZ 27.9.86. 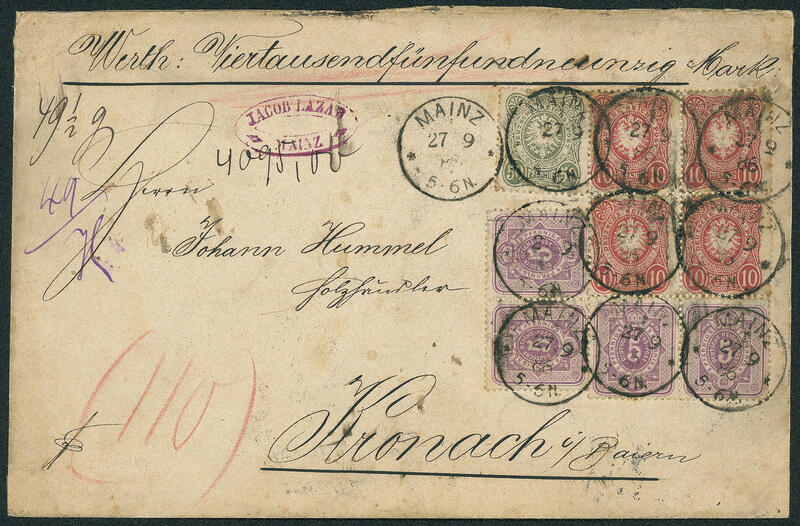 \" to Kronach / Bavaria with arrival postmark. An extraordinary cover! 4605 ✉ 40/43 5 Pfg., 10 Pfg., 20 Pfg. And 25 Pfg. 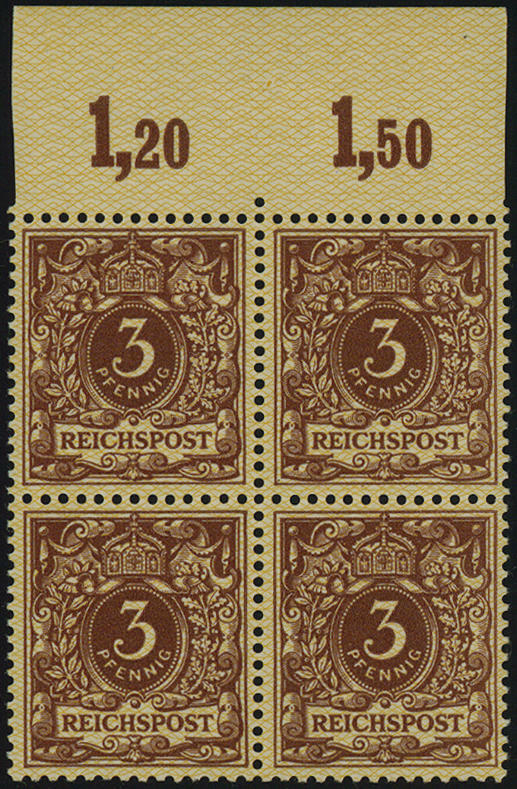 As wonderful four-color franking on correctly franked franked gef. Registered cover with rectangle cancel \"Mulhouse 17.6.89. 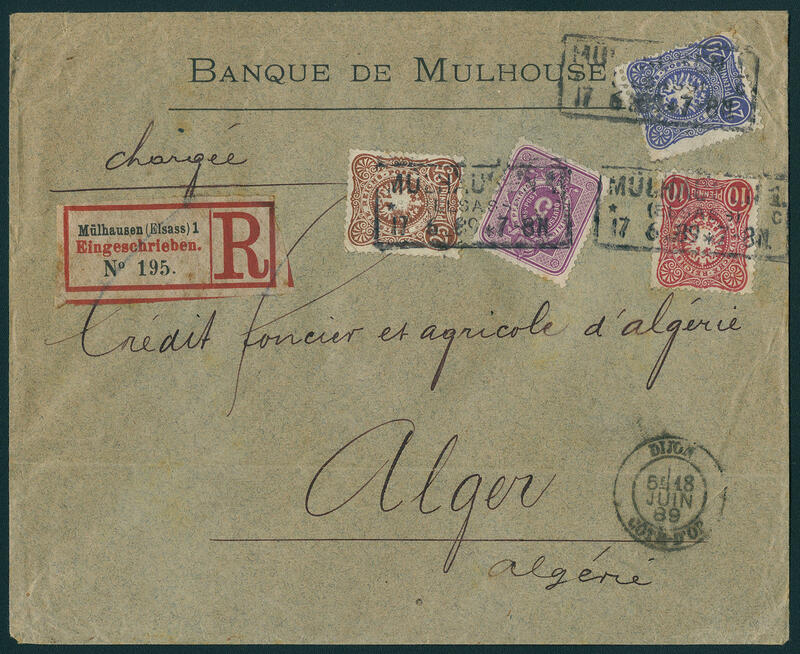 \" to Algeria with transit and arrival postmarks. Registered covers of this issue to Africa are extraordinarily rare, whereby these four-color franking especially desirable is! 4606 ✉ 41IIb,44IIb 10 Pfg. Bright red carmine and 50 Pfg. Olive, fresh colors on correctly franked cover with single circle postmark \"NOWAWES 7.12.88. 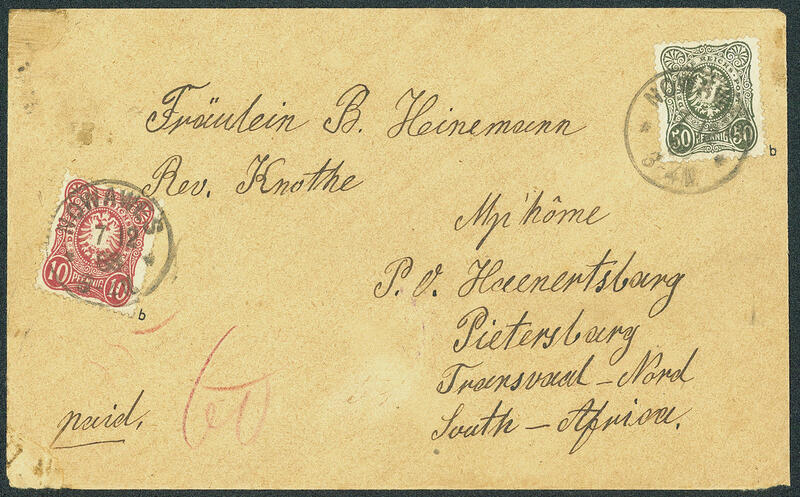 \" to Haenertsburg / Transvaal with transit stamp from Cape Town and Pretoria, as well oval violet arrival postmark \"HAENERTSBURG 11. January 89. \". An extraordinary cover with very rare destination! 4607 42IbaZS 20 Pfg. Lively cobalt, early edition, vertical gutter pair, fresh colors and very well perforated, in perfect condition mint never hinged in perfect condition, very rare, photo expertize Jäschke-Lantelme BPP. 4608 43IIcZS 25 Pfg. Orange brown, vertical gutter pair, fresh colors, once prefolded, in perfect condition mint never hinged, expertized Wiegand BPP. Michel 300,- €. 4609 ✉ \"BERLIN W. PA9.18.3.86. 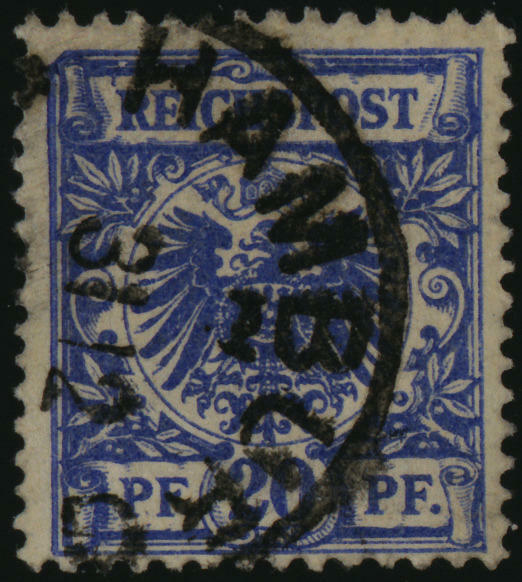 \", single circle postmark neat on post paid Reich official matter with on the back seal impression \"Reich Chancellery\" to the royally Landrath in Czarnikau with arrival postmark. 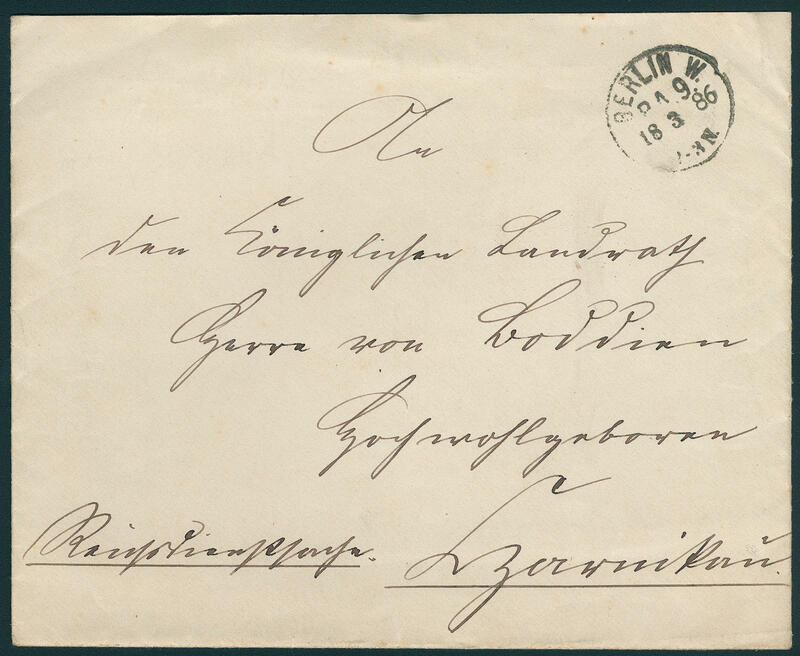 The cover has still the full content with original signature of the Chancellor of the Reich \"OTTO from BISMARCK\". In this kind a significant rarity for the historic interested collector! 4610 ✉ 45/46 3 Pfg., 5 Pfg. 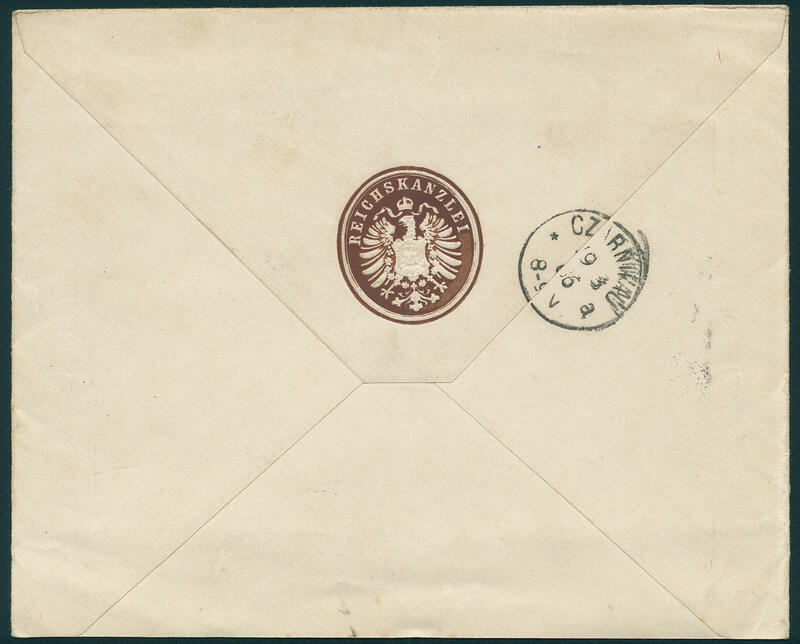 Crown / eagle on very nice, under-franked cover from \"DRESDEN 11.5.92. \" to Tunis / Tunisia, there postage due and postage stamps added with postage due stamp 5 C. In the horizontal pair and returned with different cancellations respectively handwritten note. An unbelievably more impressive return envelope of the issue crown / eagle with rare Africa destination. In this combination a rarity of this area! 4611 ✉ 45c,46c 3 Pfg. Yellow brown in the horizontal corner margin pair top right and 5 Pfg. 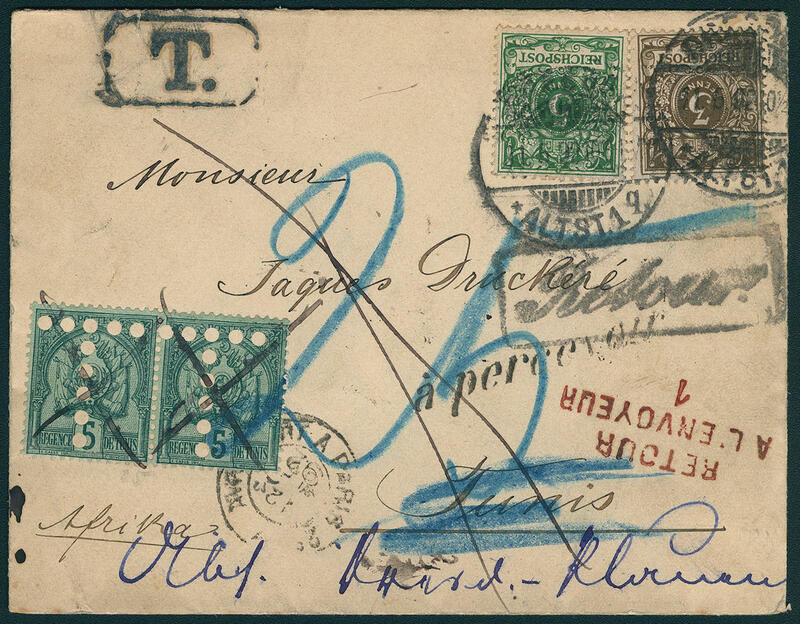 Bluish green from of the right upper corner of the sheet on very nice, faultless cover from \"LEIPZIG 1.8.99. 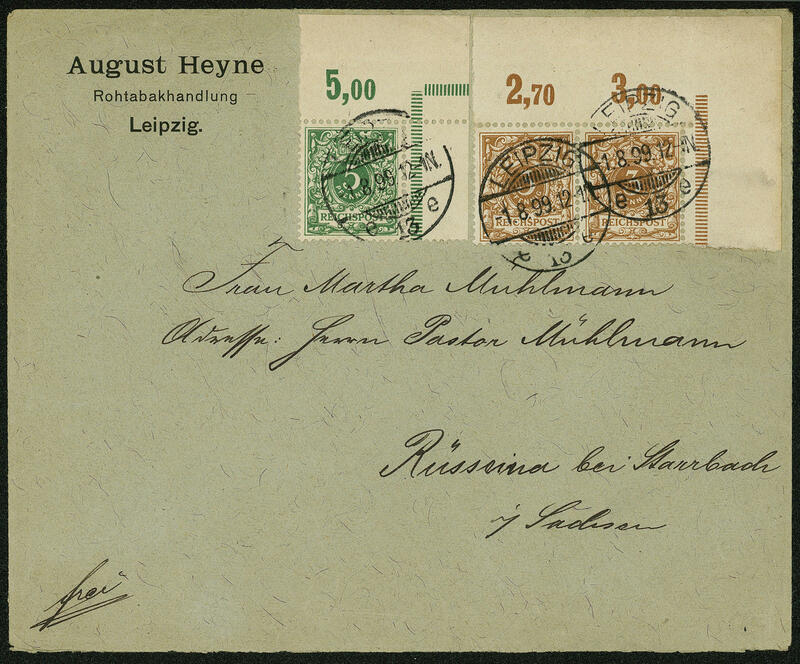 \" to Rüssiena with arrival postmark. Already several corners of the sheet are on covers hardly to find, in this combination a top piece for the advanced special collection! 4612 45PIV 3 Pfg. Crown / eagle, proof in red-brown with segurity negative pressure in yellow, block of four from upper margin, wonderful fresh colors and very well perforated, in perfect condition mint never hinged a spectacular rarity, photo expertize Zenker BPP. 4613 46b 5 Pfg. Yellow green, crown / eagle, wonderful block of four the early edition, wonderful fresh colors and extraordinarily good perforated, unfolded and in perfect condition mint never hinged, without any signs. A particularly beautiful and extremely scarce unit! Photo certificates Zenker BPP (1990) and Petry BPP (2017). 4614 47eZS 10 Pfg. Dark rose red in the vertical gutter pair, unfolded, wonderful fresh colors and very well perforated, in perfect condition mint never hinged, without any signs. A wonderful unit of this rare colour for the highest standards! Photo expertize \"perfect quality\" Wiegand BPP. 4615 ✉ 48 20 Pfg. Crown / eagle, very nice correctly franked multiple franking on complete international money order from \"Hamburg 6.12.99. \" over 5 Dollar to California with transit stamp. Franked money orders are very rare, which here is a particularly beautiful example! 4616 48a 20 Pfg. Medium ultramarine, in perfect condition unused, expertized Zenker BPP. Michel 240,- €. 4617 ✉ 48a 20 Pfg. 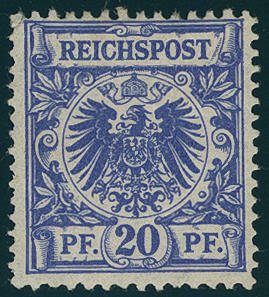 Crown / eagle, horizontal pair on decorative small-format cover from \"Cologne 2.11.91. 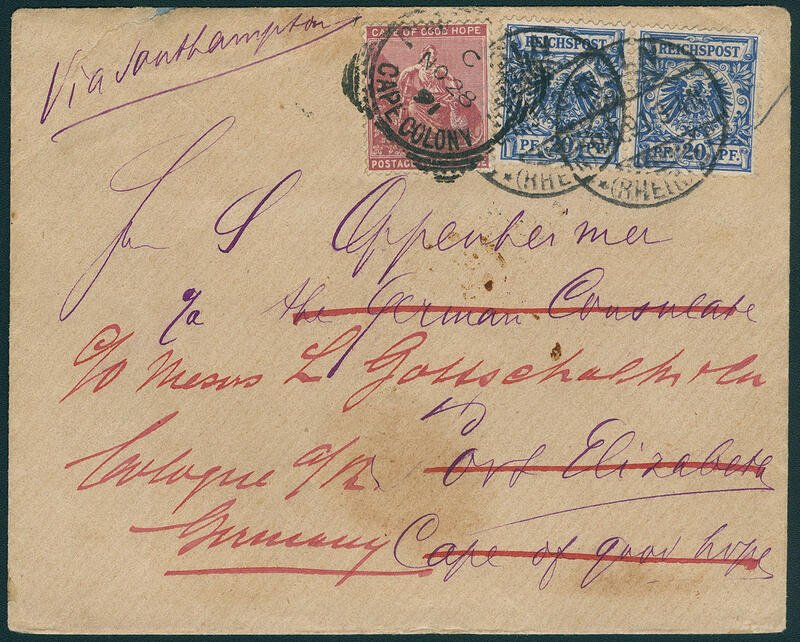 \" to port Elisabeth / Cape of Good Hope, there returned and postage stamps added with Cape of Good Hope 3 P. Lilac from \"port Elisabeth CAPE COLONY 28. NO. 91. \" to Cologne with arrival postmark on the back \"Cologne 21.12.91. \". An extraordinarily interesting and extremely rare postage stamps added return envelope with Africa destination! 4618 ✉ 48a 20 Pfg. 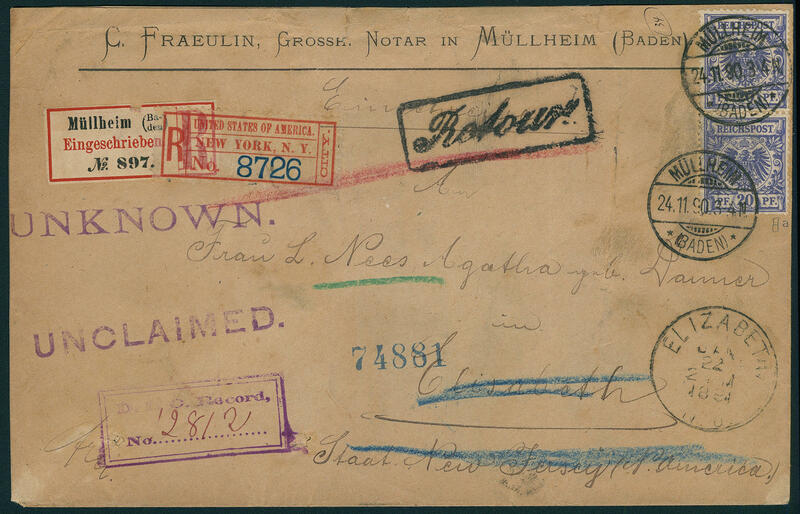 Crown / eagle, vertical pair as correctly franked multiple franking on registered cover from \"MÜLLHEIM BADEN 24.11.90. 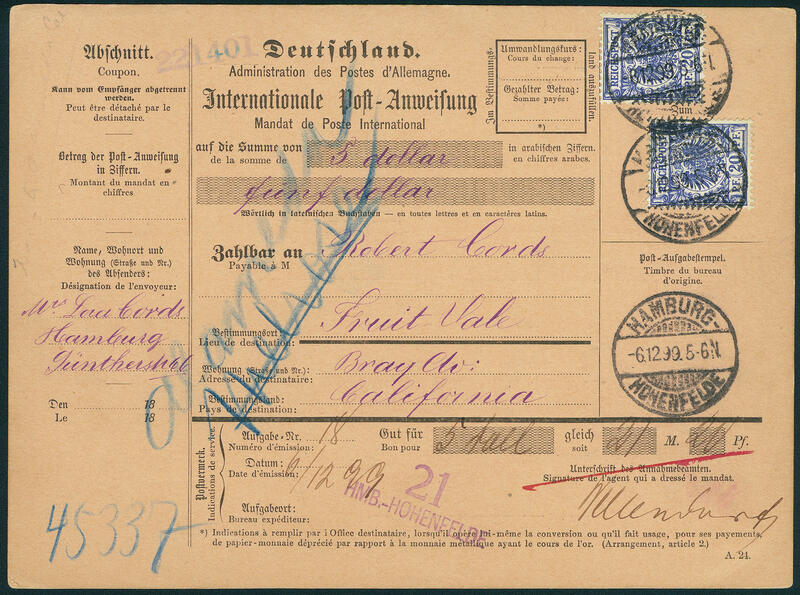 \", to the United States and again returned with German and American registration label, as well returned rectangle cancel and different transit and arrival postmarks. Expertized Wiegand BPP. 4619 ⊙ 48aI 20 Pfg. 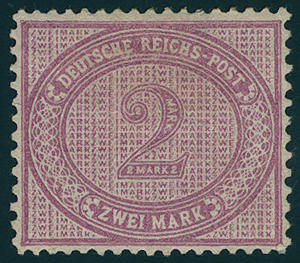 Ultramarine with spectacular plate flaw \"left upper corner bevelled\", wonderful fresh colors, very well perforated, especially nice and neat cancelled \"Hamburg\". 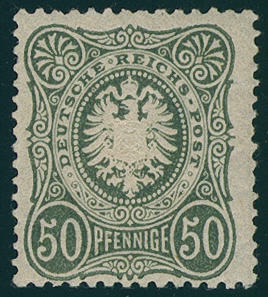 This plate flaw belongs to the largest rarities of the issue crown / eagle, there very few examples from this known are. By Michel as is known low catalogue values! Photo expertize Wiegand BPP. 4620 ✉ 48d 20 Pfg. 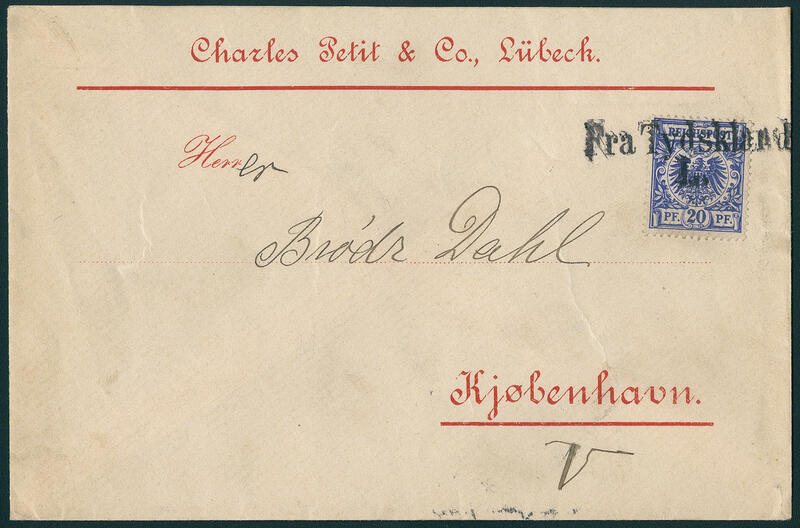 Crown / eagle, fresh colors and in perfect condition as correctly franked single franking on very nice shipÂ´s mail cover with Danish two line cancel \"FRA TYSKLAND\", mailed in Lübeck, to Copenhagen with arrival postmarks. Very decorative and rare!